My palate has wanderlust again. I’ve been thinking quite a bit about Vietnamese food and the influences the French left behind. I have a hankering for Pho. I’m desperate for a good bánh mì. So it should come as no surprise that when I was invited to put together a dessert recipe Yagööt and the launch of their new line of Yagööt@Home, I chose to go the Southeast Asian route and use some inspired ingredients: coconut frozen yogurt, Thai basil, a French red wine, ginger. Sriracha. Sometimes a recipe comes together so easily. Ingredients fall into each other like long-lost friends, perfectly happy to hang out again. And while everything except the sugar and strawberries (and the coconut Yagööt of course) in this dessert are savory, I can guarantee that it makes one of the sexiest desserts you’ve ever tasted. And did I mention that it takes only ten minutes to make? 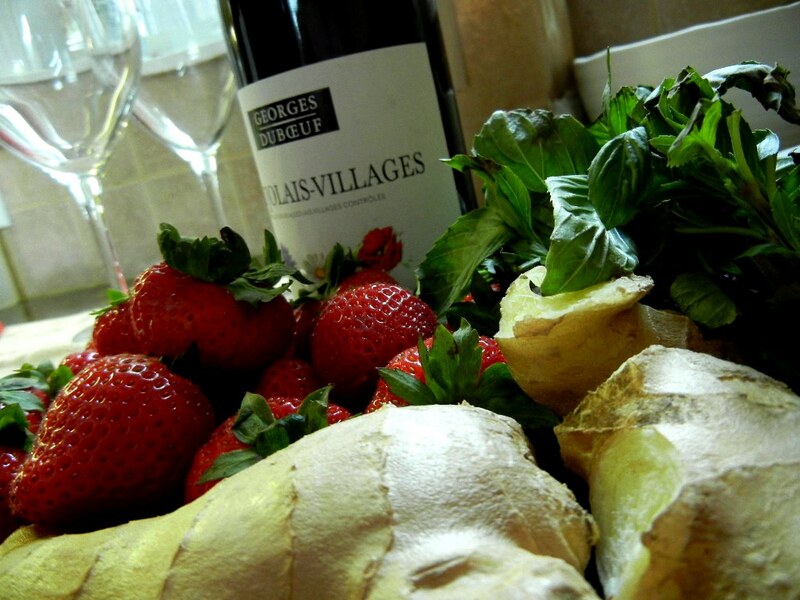 For the red wine in this recipe, I used a Beaujolais-Villages, because it’s widely available as well as relatively inexpensive. An inexpensive pinot noir would work, too. I use only a cup, so heck, you can kind of throw this together if you’ve got a bit of wine left over from dinner. This time, I used fresh strawberries, but you can bet that I’ll be pulling out all those strawberries we picked and froze earlier this year when the weather gets colder. The recipe calls for Thai basil, which is at every Asian grocery store worth its salt. I think it’s pretty critical to the flavor profile of the dessert, but in a pinch you could substitute some standard basil. Sriracha is another seemingly exotic ingredient, but widely available in most grocery stores. Buy a bottle and you’ll find yourself putting this spicy hipster ketchup on everything from your morning eggs to Friday night pizza. It’s delicious. Feel like being daring? Want to try this recipe? How about some free Yagööt? Get some food people together and you can come up with some pretty tasty ideas. At dinner recently, my friend Bethia pointed out how flowery Kate‘s sage plant was and plucked a few of the purple blossoms for us to pop in our mouths. Our eyes widened and we were immediately smitten with the surprisingly honeysuckle-y sage-iness of the teensy lavender-colored blooms. Enterprising Kate made up a quick batch of sage flower syrup and kindly gifted me a batch. I love that girl. 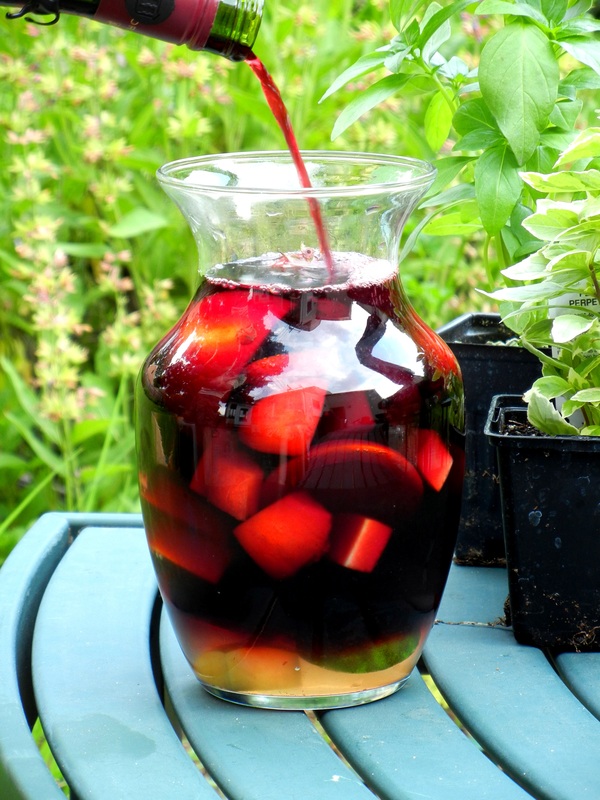 I used some this afternoon in some red wine sangria. My sage plant in the background with the last of the flowers on it. Note the syrup and the triple sec in the bottom of the pitcher. Make sure to give it a good stir. Sometimes, the heavens align to make my cooking for the week a little easier. Enter the brisket. Such a great cut and so flexible. Sidenote: I’m in serious trouble if Zeus is reading this post, because in the country I was raised, brisket can be prepared one way only. Small exceptions are made one day out of the year – March 17th – when it is acceptable to consume corned beef. A brisket is a great, inexpensive cut of meat that’s superbly tender if it’s been given some low and slow cooking (just like bbq, y’all). And if you cook a really big piece of meat one day, you are left with the lovely proposition of leftovers. 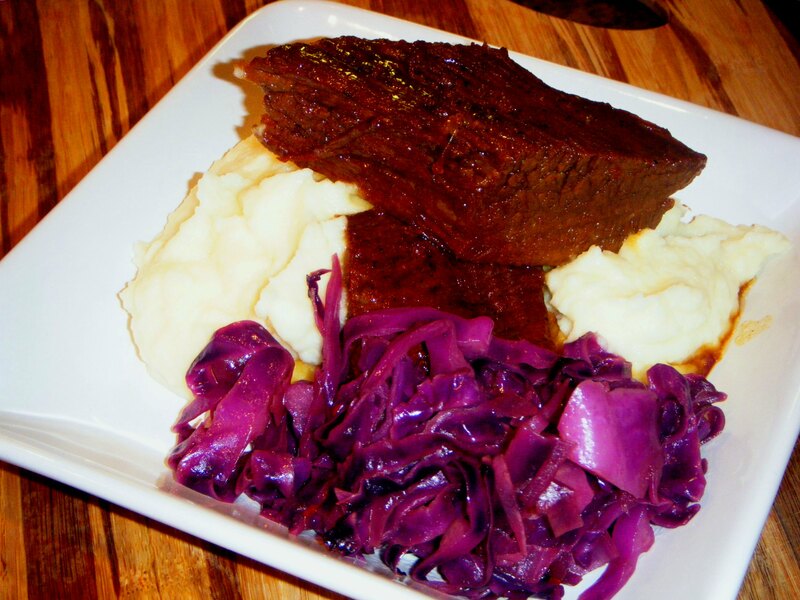 Tonight, this simply-braised brisket was served in generous slabs lacquered with the cooking liquids. Partnering it was a silken parsnip and potato puree and the world’s greatest (hyperbole, perhaps) spiced purple cabbage. A bit like a dinner in Alsace. The excess brisket will be the base of two more days of worldly deliciousness. Look later this week for recipes in which the leftovers will be dressed up in tight Mexican Mariachi pants and a big hat and then subsequently looking demure in a separate Philippine dish. Globetrotting indeed. You can’t find a fresh, ripe, beautiful red tomato here in Ohio in January. You just can’t. So how could you possibly make a bolognese in the depths of winter? 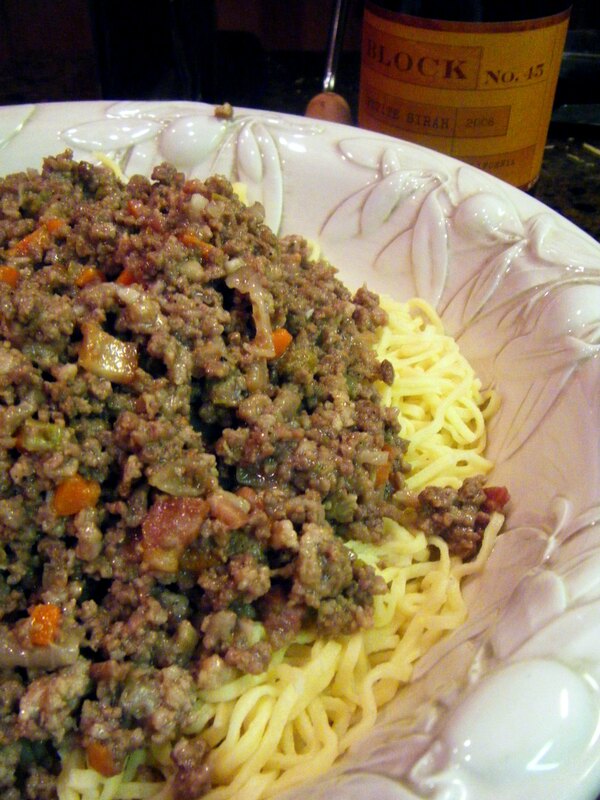 Make a white bolognese. Skip the tomatoes altogether and make a very Italian specialty. In doing so, you will make my single most favorite thing to cook. It is my most favorite of all favorites. Really, truly. The kind that my small family of three will piggishly devour an entire pound of pasta, with Cherub (remember, she’s three) helping herself to thirds. It is, in a word, delicious. Amazingly delicious. Well, that’s two. But I mean it: if you have yet to make a recipe from this blog, you should make this one. Since I’ll be headed to warmer climes tomorrow to visit Demeter and Zeus in Texas, the next few posts will have a different feel. Texas is famed, after all, for being “A whole ‘nother country”. Posts will more than likely contain things such as enchiladas, nachos, margaritas, brisket and Shiner. The stuff that still kind of runs through my veins as a Texas girl. Good times, dear readers, real good times. In anticipation of that, I made some fish for dinner tonight. Zeus already snickered when I told him that I had vegetarian Indian food on Sunday. “Ha! We don’t eat a lotta veggies down here. We eat meat!” I know Daddy. 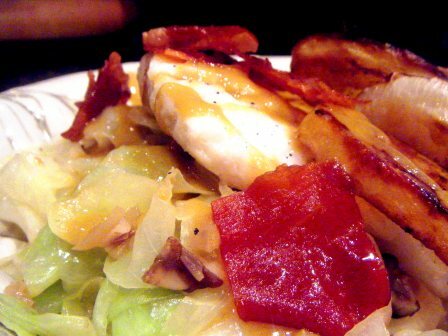 Tonight’s cod was simply prepared and served alongside a seasonal, warm cabbage salad with mushrooms, shallots, and some crispy prosciutto which becomes delicate and almost glass-like when fried. To boost the vegetable portion of the dinner, I roasted thin disks of potato and turnip. Drizzled over all of this was a mustard and ume plum vinaigrette. When I worked in South Orange, New Jersey, there was a little tiny delicatessen (the Town Hall Deli) that claimed to have invented the sloppy joe. This is not a manwich (i.e., can o’ sauce over ground round). This is a serious sandwich with usually a couple of types of meat (the original had slices of tongue), cheese, coleslaw and housemade russian, all on rye. Good stuff. Those sandwiches could feed a small classroom of fourth graders. They were huge. Tonight I continued with a Hanukkah theme. I made the PK version, and wisely made them smaller. 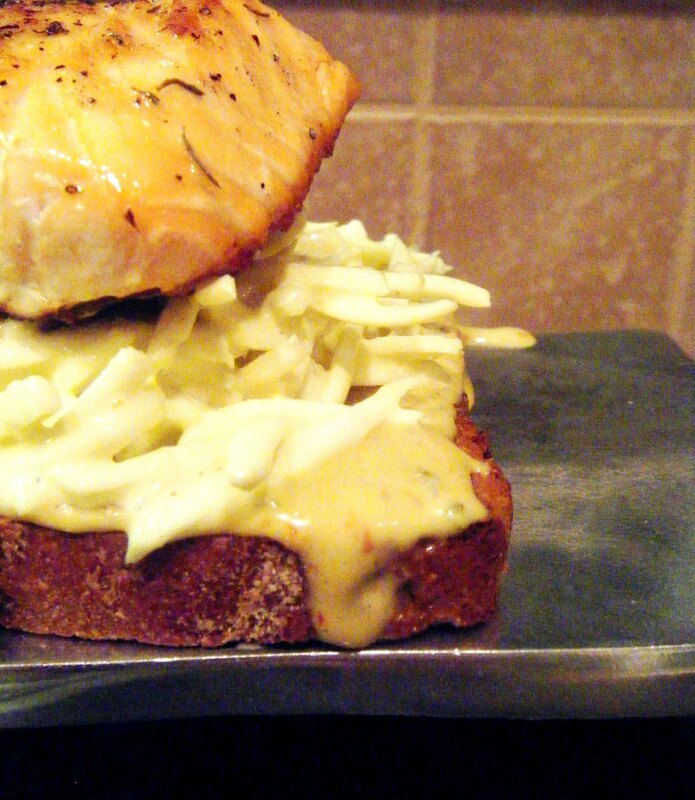 A single slice of toasted rye was slathered with homemade Russian dressing, topped with slices of caraway gouda from Oakvale Farmstead, and piled with celeriac remoulade and pan-seared salmon. You may have noticed that I like to enjoy a nice wine with dinner all the time now and then. So of course I wanted to give extra thought to the wine pairing for my favorite food holiday: Thanksgiving. I visited with my friends Josh Shapiro and Miss McCoy at Vino 100 Short North to figure out what would taste great with my dinner, and heck, your dinner, too. Persephone’s always happy to help! Here are our picks. Josh recommends that you pair your bird with a rosé from Provence. While rosé used to have a terrible reputation in the 80’s as overly sweet and well, kinda gross, now rosés are being rediscovered by the cool kids. Not just for summer drinking anymore, Provence rosés add a smidge of elegance to a holiday meal. A couple of good ones are Commanderie Bargemone ($17) which is delicate and has a dry finish, and Domaine de Terrebrune Bandol ($30), which was awarded 90 points by Wine Spectator. The nice thing about these is that they appeal to both red and white wine crowds. Success! Beaujolais, also being touted as Gamay, referring to the grape, pairs well with a rich holiday meal. The acidity in Beaujolais partners skillfully with the turkey and rich gravy. These are not the unserious Beaujolais Nouveaus you’ve read stories about. These are beautiful, balanced wines that have black fruit and cherry flavors. The 2008 Pierre Chermette ($19) is lushly fruity and velvety with a peppery finish. For a Cru Beaujolais, Josh recommends the Domain Chignard Les Moriers 2008 ($25). This is what’s being served at his house. No word yet if he is accepting reservations.